Live the high life in this seriously stylish apartment. The Ocean Drive Residence is a little slice of indulgence, waiting to pamper you in Edinburgh’s most cosmopolitan destination, The Shore. This two bedroom, two bathroom apartment sleeps up to four guests in style, and has recently been fully refurbished, setting the bar high for contemporary living. Every inch of this dream home-from-home has been thoughtfully redesigned, from the flooring to the flatware, ensuring your romantic getaway or family holiday is one to remember. Put your feet up and relax in the spacious living room after a long day’s shopping and sightseeing. A mix of mid-century modern furniture and local artwork delight the senses in this lovingly decorated lounge, perfectly combining comfort with culture. Should you need a little external stimulation, large windows span the extraordinary, curved feature wall, providing a glimpse of outside life. Your electronic needs are also met, with a large, flat screen TV with Freeview, DVD player, iPod dock, mini iPod loaded with tunes, and WiFi all provided for guests’ use. Feeling peckish? Move through to the brand new kitchen and cook up a storm. Quietly confident in its slick exterior, this is no plain old pantry. State of the art appliances are at hand to help with the nitty gritty, including Siemens induction hob, oven and combination oven/microwave, and AEG dishwasher, washer/dryer and fridge freezer. Whether you’re enjoying your own culinary masterpiece, or a quick coffee and croissant before a busy day, the modern dining table can seat up to four guests. With a touch of tartan and a dash of deluxe, a good night’s sleep is guaranteed in the two inviting bedrooms. Experience slumber quite literally fit for a king, as the master suite boasts a Hypnos Premier double bed, a brand favoured by our very own Royal Family. 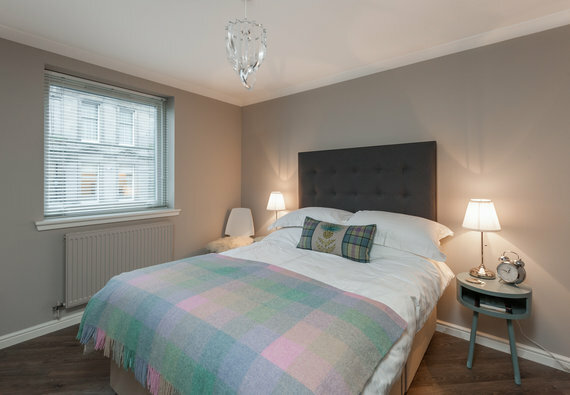 A large wardrobe and vanity area ensure the very best home-from-home convenience, as well as an en-suite bathroom with Mira power shower and luxury Scottish Fine Soap toiletries. The second bedroom also offers brand new furniture and plentiful storage, as well as zip and link beds that can be set up as a super king or twin beds. Hairdryers, straighteners and a vanity pack are all available for guests' use. The family bathroom is decorated in calming neutral tones, perfect for a long soak in the tub. The local area is one of the finest in the city. The Shore plays host to chic bistros, cocktail bars, and even Michelin starred restaurants, as well as art galleries and independent shops. Fancy something a little more commercial? Just a few minutes along Ocean Drive will take you to rainy-day paradise Ocean Terminal, full to the brim with high street and department stores, a cinema, gym, and popular eateries including Wagamama and Pizza Express. Permanently moored alongside Ocean Terminal is the Royal Yacht Britannia, voted the UK’s number one tourist attraction on TripAdvisor in 2014. However, if you find yourself yearning for medieval streets, castles and extinct volcanoes, fear not as the hubbub of the city centre is within easy reach. Just 15 minutes on one of the many buses servicing the area, and you’ll be strolling along the Royal Mile or climbing Arthur’s Seat. If you’d rather bring the car, the Ocean Drive Residence provides a luxury few and far between in a compact city like Edinburgh: secure underground parking. Parking notes This property benefits from a designated parking space, within a secure, underground car park. Interior layout A central hallway leads to two bedrooms (one with en-suite), family bathroom, and lounge with adjoining kitchen/diner. The apartment was 1st class and contained all we required for our break. Beautiful Leith Docks location with regular bus service to central Edinburgh less than 5 minutes away. Secure parking on site and local restaurants and pubs within short walking distance. Fully recommended. Excellent VFM with efficient booking process. We were just minute away from some excellent restaurants in Shore, which was welcome after a busy day at the Fringe. We also enjoyed the quieter space of Leith after the hustle and bustle of the city's entertainments! Sehr schöne Wohnung mit Blick auf den Hafen. Geschmackvolle Einrichtung und gut ausgestattete Küche. Sehr netter und flexibler Empfangsservice.